Panache predicted in our podcast that perhaps Rigoberto Uran should be riding in support of this guy in the Grand Tours this year. 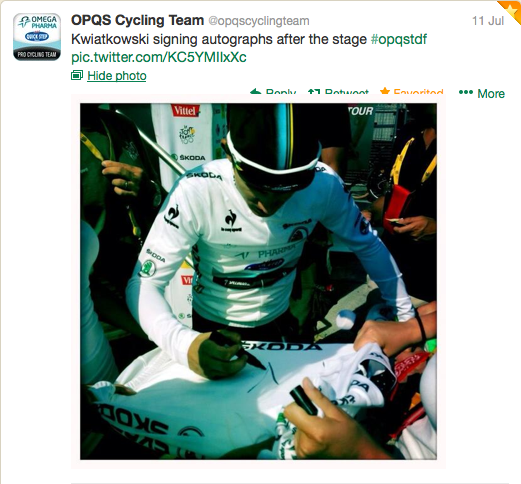 So here’s how you pronounce his name: Michał Kwiatkowski. Thanks to rowery.org for that little tidbit – make sure to read their interview with the man himself when you visit their site! They’re both in good form and starting to ratchet it up for the April fortnight of Flanders and Roubaix. Trek Factory posted this double interview with Tom Boonen and Fabian Cancellara to talk about their friendly rivalry and this year’s Classics. Tweets of the Week: Fabs gets waxed, Greg’s gloves and a naked rider! The classics started last weekend and weren’t we excited? So we have some Boonen and the Pharmers! Cows in socks! A begowned Cancellara! And this week’s ‘naked rider‘ in the form of …?